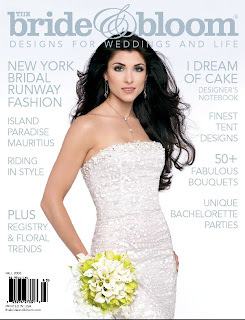 cakelava: The Bride & Bloom Magazine! Today couldn't have started out more perfect! Ever since Rick was invited to design a cake for the "Color Pairing" feature of The Bride & Bloom Magazine's Fall 2008 issue, we've been giddy with excitement for its release, and we don't have to wait long because it is being released nationally tomorrow! The Bride & Bloom Magazine, is an exquisite national wedding publication, one of the very best out there, and if you pick up a copy, you'll see why. The editorial is on the cutting edge of fashion, the colors pop off the page and I must have looked through our current issue from cover to cover at least 3 times already. For those not familiar with the magazine, the color pairing feature is a color inspiration composite found near the front of the magazine. 2 cakes per issue get the honor. We were given a color palette and components and asked to design a cake around what we were provided. After seeing our feature, we are very pleased with the outcome. We shot the feature with the wonderful Stefanie Riedel, of Absolutely Loved who we've worked with at many weddings and magazine shoots and she captures the cakes beautifully! The interesting backstory on this is that during the communications with the magazine, we found out that the other cake designer in the Color Pairings was none other than Gabrielle Feurersinger, who Rick worked with at Cake Divas in L.A. Our contact at the magazine had read both of our bios and realized Rick and Gabrielle both worked for Cake Divas, and had started their own companies, Rick with cakelava and Gabrielle and with Cake Coquette. Gabrielle is quite a talent and works exclusively in buttercream. It was a coincidence that both were contacted for the same feature. What a small world!